ABOVE: Hardware is the jewelry of the house. Is hardware from a fine 1790 brick Federal appropriate in a farmhouse of the same era? What kind of entry set best suits an 1895 town house? And what about the explosion of new and revival styles during the bungalow era? The answers aren’t always obvious. Most of us have an easy familiarity with hardware styles, except when it comes to choosing the right fittings for our own houses. Let’s look at hardware through the decades. Before 1800, most household hardware was hand-forged at a blacksmith’s shop. More rarely and expensively, brass hardware was imported from England. 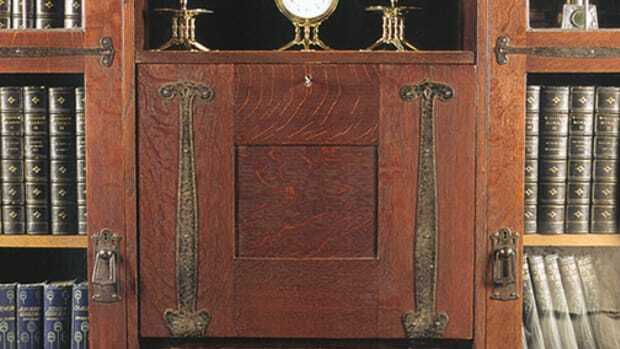 Rat-tail hinges, rim locks with slide bolts, and S-shaped shutter dogs were commonplace pieces of art. 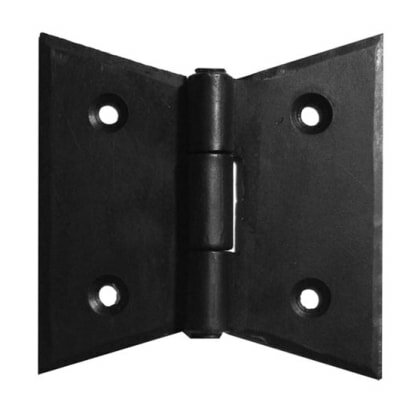 High-fashion hardware for furniture and entries about 1750 meant elaborate Chippendale plates and pulls. In the Federal period, furniture was finished with delicate, die-stamped oval Hepplewhite plates. Classically proportioned Sheraton knobs and rosettes appeared on the best front doors in the first years of the 19th century. 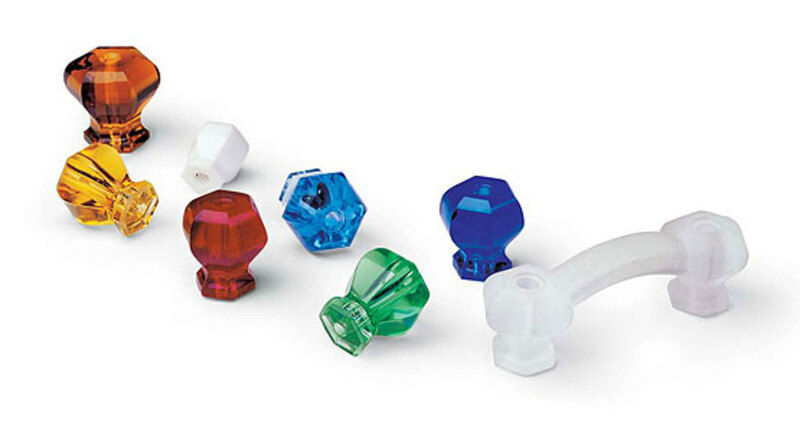 About 1820, the first cut-glass knobs were produced in America. Pioneering industrialists began turning out mineral knobs in white, black, and Bennington brown by 1840. Ten years later, they’d perfected mercury glass, the result of silvering the inside of a glass knob with mercury to produce a shimmering knob that looked for all the world like silver. 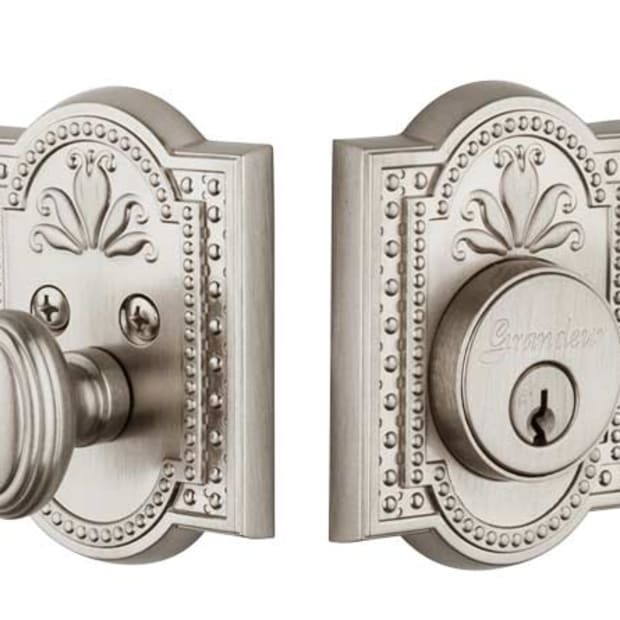 After the Civil War, manufacturers geared up to produce some of the most beautiful decorative hardware ever made. 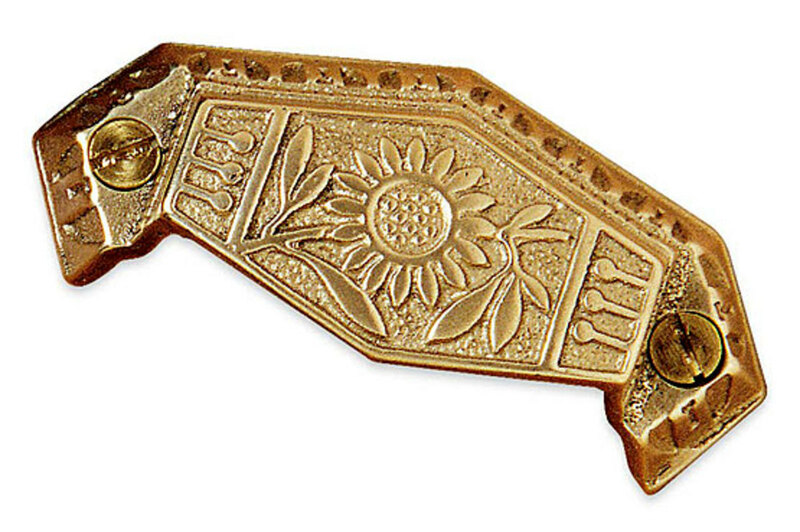 A lovely Victorian Aesthetic-sunflower bin pull from Horton Brasses. 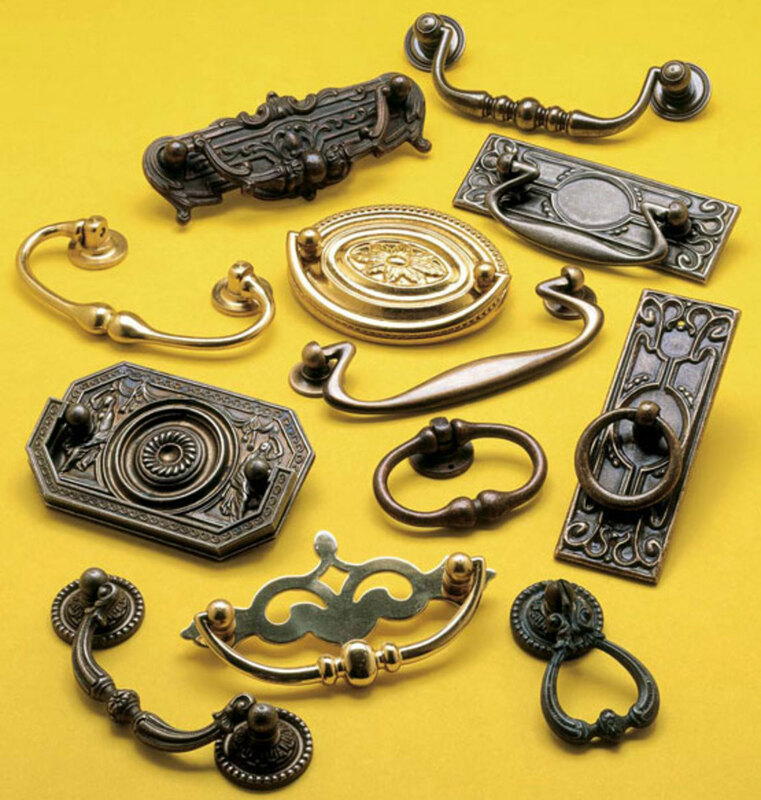 Precursors to Arts & Crafts styles, Eastlake and early Aesthetic Movement hardware showed a fascination with things Japanese. Steeple-tipped finials in brass and bronze, nickel-plated brass escutcheons, doorknobs covered with incising and figures in relief; even door hinges received lavish decoration. 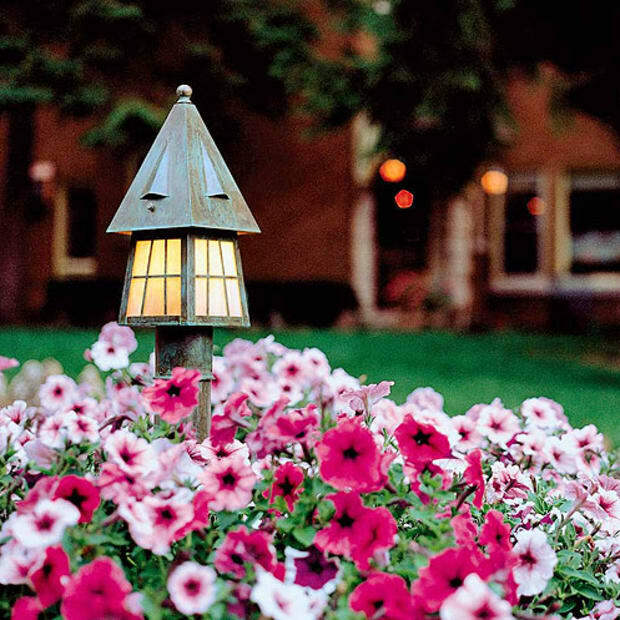 To make these exotic, elaborate styles, manufacturers used sand casting. In this very old method, sand is packed around a hand-carved model; the model is removed and molten metal is poured into the mold to produce a knob or rosette with finely grained detail. (Another ancient method, lost-wax casting, is capable of producing even finer detail. The best reproduction late-19th-century hardware is typically made by one of these methods.) Less expensive hardware was stamped rather than cast in the same fashionable designs. After about 1880, designs became even more elaborate and romantic, drawing on historic motifs from classical Greek to Rococo. By then, manufacturers were perfecting the art of plating, which made it possible to finish light-weight, less expensive stock with a high-end nickel, copper, or bronze finishes. Fashionable, low-cost builders’ hardware had arrived. Rebelling against Victorian busy-ness, proponents like Gustav Stickley and the Roycrofters adorned their furniture with simple, hand-hammered plates and pulls in brass, copper, and iron. 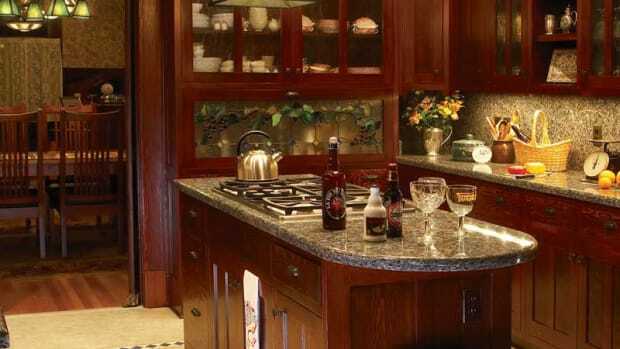 As the Movement evolved into a full-blown style, manufacturers of builders’ hardware jumped on the bandwagon, mass-producing versions of Stickley-style escutcheon plates in stamped brass. 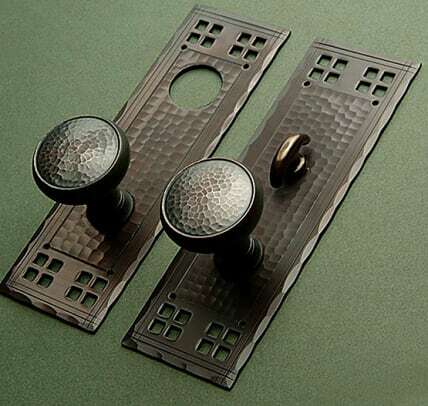 Hardware suitable for Romantic Revival homes, from Omnia Industries. By the 1920s, the more obvious Arts & Crafts hardware was passé. Many Americans had gotten their first look at Europe during the Great War, and they brought back romantic notions about Tudor England and medieval France. On the home front, the colonial past had never been more popular. History was hip. 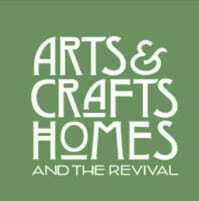 Although some hardware was custom made for Revival-style homes, manufacturers were soon churning out largely interchangeable reproductions in every material and style to outfit houses in the newly fashionable Tudor, Spanish Colonial, Mediterranean, Italian Renaissance, and Norman Revival styles. 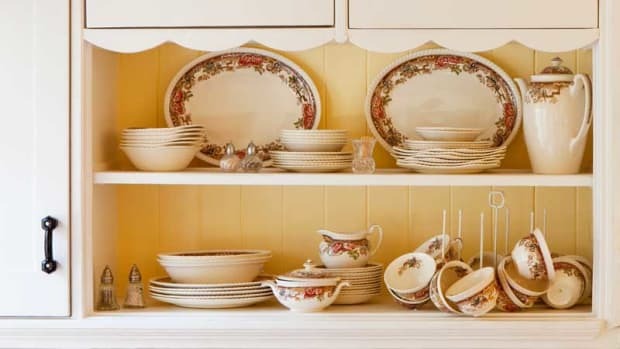 Along the way, they introduced historical designs that had rarely if ever been seen in America before, such as openwork filigree or twined wrought iron in levers and handles. Depression-era glass knobs from Crown City Hardware. High style still existed, of course, primarily in cities like New York, and mostly in commercial applications. Deco, Streamline, and Moderne influences didn’t really begin to percolate into American homes until the 1940s, when the first plastics (Lucite and Bakelite) and futuristic metals (aluminum and stainless steel) began showing up in hardware. By the 1950s, however, the undecorated, almost invisible shapes of Modern hardware were ubiquitous. 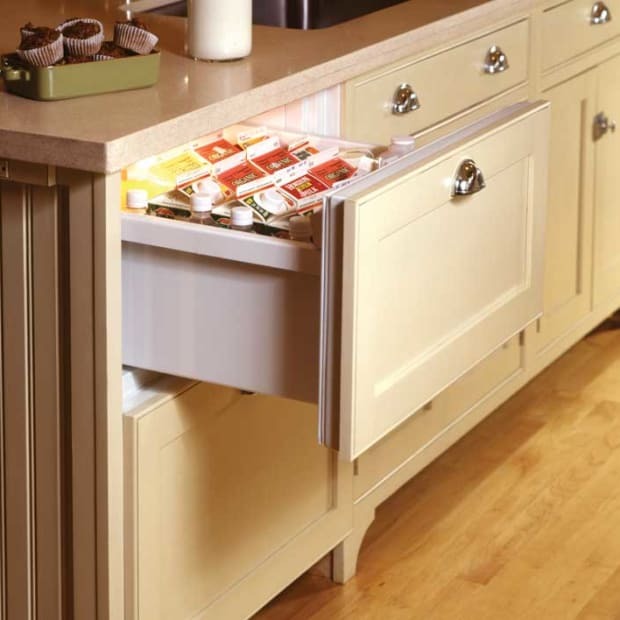 Now considered Retro, floating organic cabinet knobs and streamlined cylindrical locksets are often available in unused, virgin form.